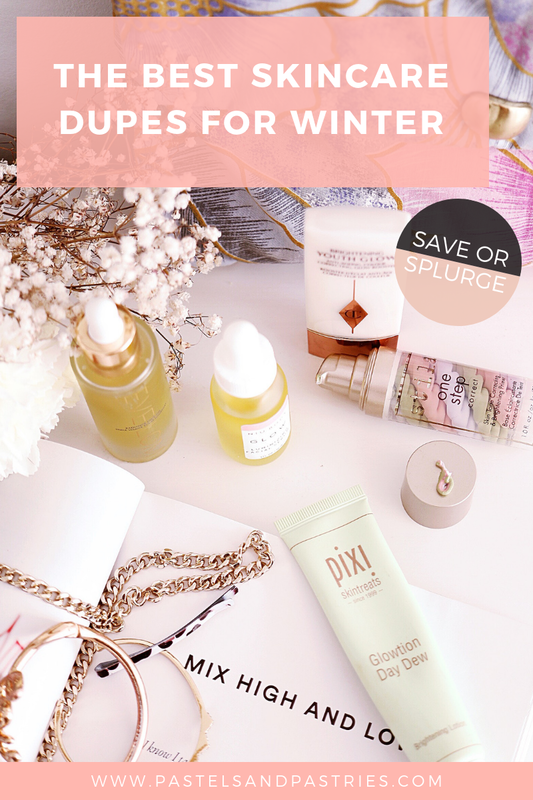 Affordable skin care products that perform just as well as the luxe favorites? Yes, they exist. If you are looking to find those killer dupes that rival in performance, will improve skin tone and texture and really amp up the glow, I got you covered. Lately, I've been receiving questions on what are some affordable and accessible products that are available at the drugstore. Investing in your skincare can get quite costly and it isn't always an option. Or you may just be looking to try something new and want to dabble into drugstore goods before you make the plunge into some luxe ones. There is so much out there and sometimes we stick to what we know. If you're looking to break out of your routine and try out these products that legit match their higher priced counterparts, keep reading! Yes, it's true. The Charlotte Tilbury Brightening Youth Glow will illuminate your skin from within. It's smooth, the texture is so light and it glides on the face like a dream. It also colour corrects and primes the skin, and often I mix it with a drop of foundation to act as all-in-one CC cream. I do really love it. However, at a fraction of a price Pixi Beauty Glowtion Day Dew does all the same! It leaves your skin so dewy and radiant and I find it does provide the same kind of luminosity. It is also extremely weightless and glides on perfectly. I will also mix it with some foundation to add some bronzey glow. This dupe is seriously one of my faves! You get an amazing bang for your buck and it's definitely worth the $30 you'll pay at Shoppers. I've tried both and can honestly say they both work basically identically. The Stila version is a bit heavier, while the QUO definitely feels a bit more watered down, however they both go on smoothly. I find the Stila to blur fine lines a bit more, however, the QUO feels a bit softer to the touch. I love these three-in-one correctors because they tackle all issues-- the green combats redness (which I have tons of in winter), the purple brightens the complexion and the peach evens discoloration and primes. 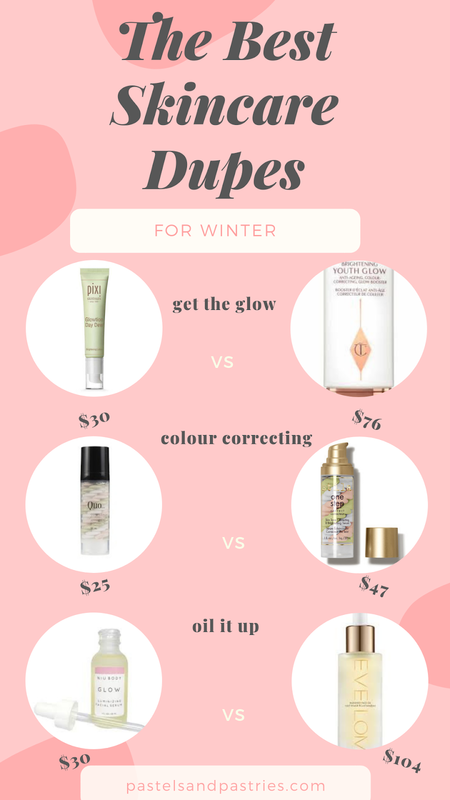 To be honest, if you're looking for a colour corrector this winter, I'd go with QUO and save the extra $20! Since I only use correctors in the winter, I'll save and pick up the QUO next time. I can't find the QUO version online, but just head to your Shopper's Drug Mart to pick it up! It looks the same as the Stila container. I love Eve Lom. I really do. When it comes to face oil there is something so luxurious about it, and it makes me feel so glamorous. The Eve Lom oil smells lovely, a little goes such a long way and it does make your complexion radiant, hydrated and dewy. The NIU serum is a great alternative. It really does boost radiance and leaves you bright and radiant for a steal of a price. You can mix it into your moisturizer if you find it is too heavy or want a lighter finish. It's packed with jojoba oil, camellia oil, and bergamot oil. It leaves you feeling fresh, radiant and without a doubt bright! Are you new to face oils? Try the NIU (plus the company is run by two local girlbosses) first and see how it sits on your skin. You will not be disappointed! Do you have any amazing dupes? Also, let me know if this is something I should continue doing! Great article thanks for sharing such a useful information about skincare product. The information you present on this day is very interesting. I am really thankful to have the information from your blog about skincare product.